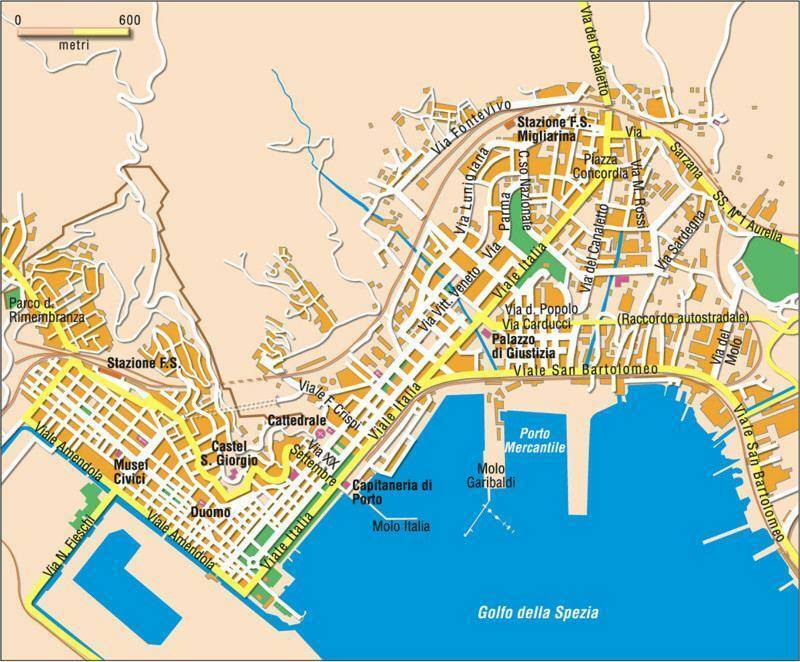 The Cruise Ships dock at the new Molo Garibaldi, from there on the city center is 15 minutes (2km) away. The train station is 4km away. A free shuttle bus to downtown is normally provided for. This cruise port will be able to accommodate two more mega ships at one time. Passengers can gain access to the center, shopping areas, restaurants, museums and the city's walking district: Via del Prione, Corso Cavour and Piazza S. Agostino, all of which are within walking distance of the new Pier. With its excellent natural harbor, the city is the main Italian naval base. The city has a fine 15th-century cathedral, which contains work in terra cotta by the Florentine sculptor Andrea della Robbia. A fortified port since the Middle Ages, La Spezia was badly damaged during World War II and liberated by the Allies in 1945. The castle of San Giorgio has been recently restored and the important Archeology Collection has been transferred here: this collection is best known for its nineteen anthropomorphic sandstone statue-stele, fashioned by the ancient people of Lunigiana in the Bronze and Iron age. Besides, the old town center has been restored and these works allowed to create an elegant and orderly town center hosting, in the summer season, many attractive musical and cultural entertainment. Note: Due to overcrowding of the Cinque Terre area, the italian government will limit the amount of visitors on a daily basis, check with your cruise line. The Cinque Terre (5 lands) is composed of 5 small villages: Monterosso, Vernazza, Manarola, Corniglia, Riomaggiore. Strung along 18km of serrated cliffs between Levanto and La Spezia, the Cinque Terre is one of Italy’s treasures. Hiking is a popular pastime. The region has an extensive network of footpaths that connect each of the five villages to one another. Some Cinque Terre hiking trails are tiring and difficult, while others are suitable for nearly everyone. The train is the easiest way to get to the Cinque Terre. There is a train service that runs between the five villages during the day which stops at every of the five towns. It is a short walk to either the train station(20minutes) or the ferry boat. Buy your Cinque Terre ticket at the National Park office at the train station. Don't forget to validate your card before getting on the train. Train alone is about 2 Euro. Trains run in each direction 1-2 times an hour. Ferries to Cinque Terre and Portovenere. Soak up the luxury of Forte dei Marmi and tour the best of the Versilia coast. Golden beaches, blue water and panoramic views await your discovery. Absorb the striking vistas of the Apuan Alps and see the legendary marble quarries at Carrara. For visiting Florence a cruise organized excursion might be the way to go, it is more than 2 hours away. Pisa can be easily done by train.